The perfect filling, rich, thick and creamy with crunchy pecans gracing the top of this decadent Southern Pecan Pie. The perfect ending to any meal. Some think the recipe came from the French, who settled in New Orleans, and some think the recipe came from the Karo Corn Syrup executive's wife, who was promoting the product. Who knows who created it--- all I know is it has been around for every holiday and family gatherings for as long as I can remember. Mother made her pie recipe from off the bottle of Karo Corn Syrup. Another thing I remember is it was one of my Father's favorite. 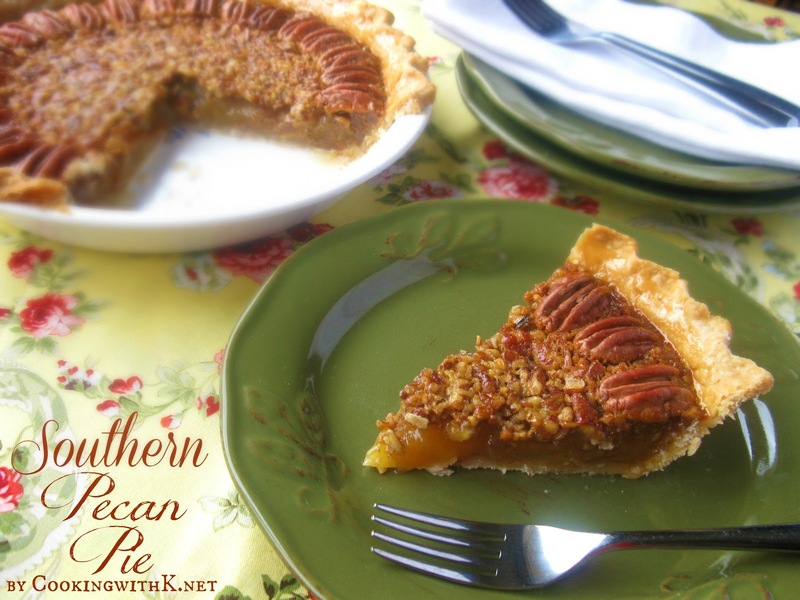 Around the South, there are so many recipes out there for this favorite pie from using brown sugar, dark Karo, and using whole pecans, toasted pecans, and chopped pecans. In fact, when I married my husband, his Mother made her pecan pies with whole pecans and my Mother always chopped hers. For years, I would make mine with whole one time and chopped the next. Until one day, I got the idea to use both, and we get the best of both Mothers. 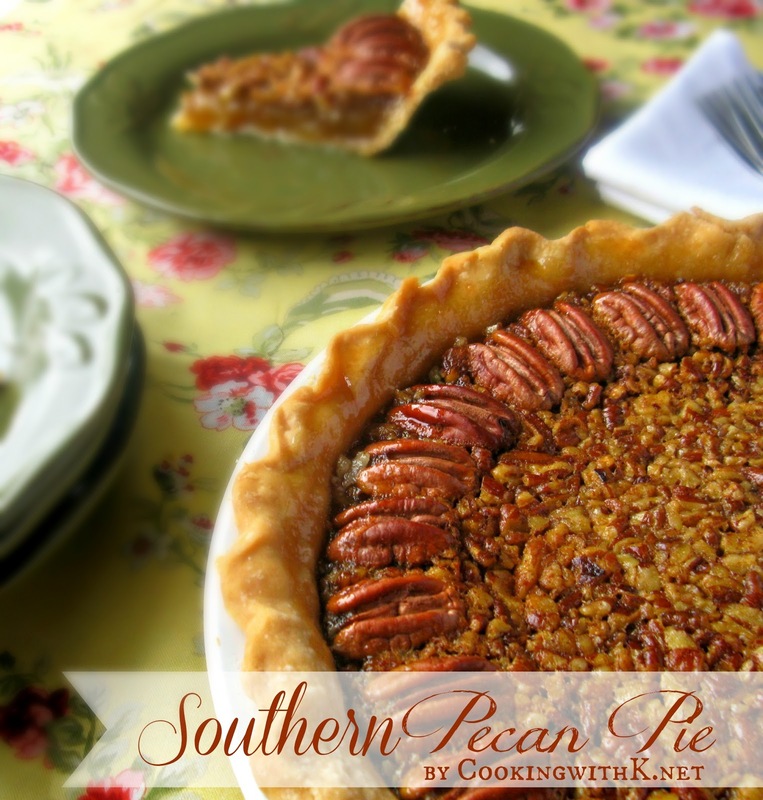 Southern Pecan Pie is an easy and simple recipe that has few ingredients. Here comes her secret to the perfect pie --- Stir the ingredients by hand with a wire whisk. No need for an electric mixer. This only creates a lot of air in the filling, causing it to be thin and frothy. Stirring it by hand creates a thick and creamy texture which makes for a perfect pie! Preheat oven to 350 degrees F. In a medium bowl, stir together karo syrup, sugar, eggs, butter, vanilla, and cornstarch until smooth and creamy. Add chopped pecans and immediately pour into the prepared pie crust. Arrange whole pecans around the edge in a single circle. Bake in the oven for 45-50 minutes. Cover with foil to avoid over browning of the crust, and bake for another 10-15 minutes or until the filling is slightly jiggly. Oh how I love this pie! It's a real classic for sure!! You are very right about stirring with a whisk. It's the best way! I do what my mom does and use half light and half dark syrup in mine, since we can never decide! Your combo of whole and chopped pecans is beautiful and clever, too! That's just about how I make it, too. I love chopped, for ease of cutting, but I line the outside edge , like you, for the prettiness factor. Pecan Pie is my all-time favorite!! I love pecan pie yet I have never made one! I love the pecans decorating the outer edge. Thank you for the tips! Yum... I adore pecan pie! Oh wow I am going to have to try this one out! I love pecan pie! I am a new follower from southern charm! I would love for you to check out my blog and hopefully you will want to follow me back! Have a great weekend, Nicole! Welcome to CWK...this pie is so easy and quick to make...a family favorite! Now I am headed over your way!! Being from Florida, we do love our Pecan Pie's. 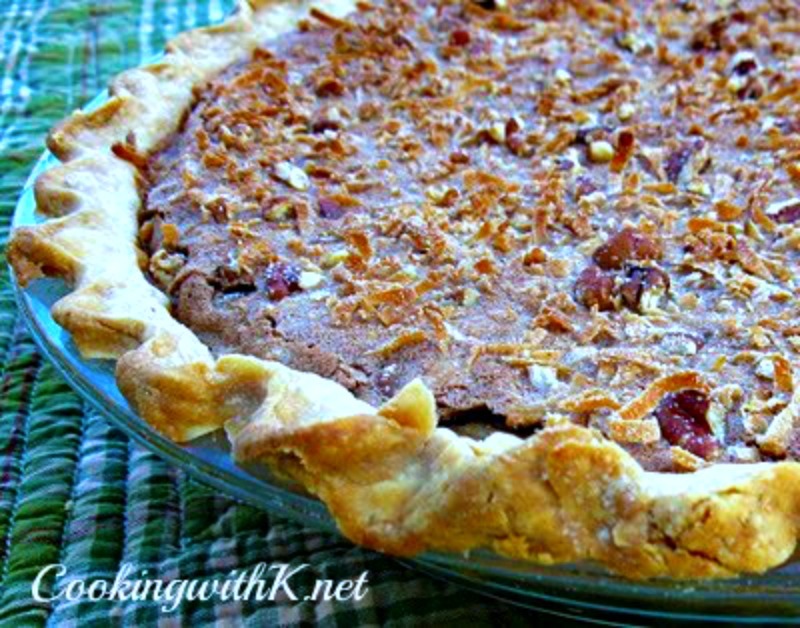 I love how you lined the Pecans next to the crust, the pie is beautiful. Pecan pie is my most favorite, but since I'm on a diet, I'll just have to enjoy your beautiful photos. Ho Hum. Looks fabulous, and I love the idea of using the chopped and whole pecans. You are a smarty! Thanks for sharing. 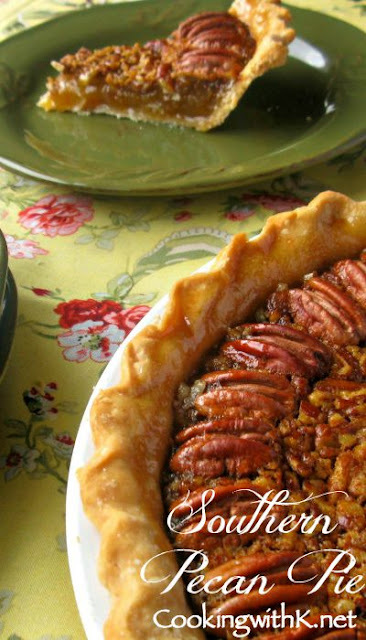 Hi K. This pecan pie looks amazing, beautiful pictures! I found you thru the Clever Chicks Blog Hop. I love pecan dessert recipes, thanks for sharing. Thank you for sharing with the Clever Chicks Blog Hop this week- I hope you'll join us again! Love the idea of family recipes :) Thank you so much for linking up with me this week at Tasty Tuesdays! I’ve pinned this & shared it with my followers! This lovely post has been featured on this week's Tasty Tuesdays! I'm also following you socially! :) I'd love it if you could grab a featured button for your blog! This pie is just gorgeous Kay! Pinned! OK Idk what I'm doing wrong but it's coming out runny can't anyone help? I'm sorry you had trouble with the pie. The only thing that will make your pie be runny is not cooking it long enough. All ovens are different…you have to adjust the time accordingly. Hope you give it another try. 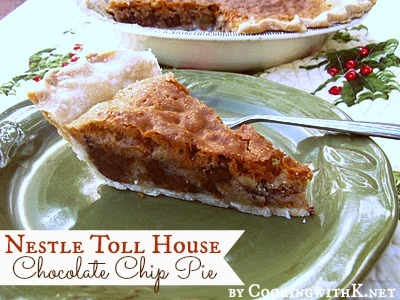 This is my favorite pie, I will give it a try, yum!! Thanks for sharing with us! Visiting from Be Inspired!! Thank you so much for stopping by to let me know you are enjoying the recipe. Happy birthday to your partner!